I really try to not apologise for being a irregular blogger these days but I think after my recent absence I need to. - Sorry!! The catch is for me the longer I leave writing a blog post the more I get overwhelmed with where to start with all my bits of news and stories and catching up on blog reading. But enough is enough and I've sat myself down and here is a post. They always say you should start at the beginning but I'll jump in with my most recent news instead. 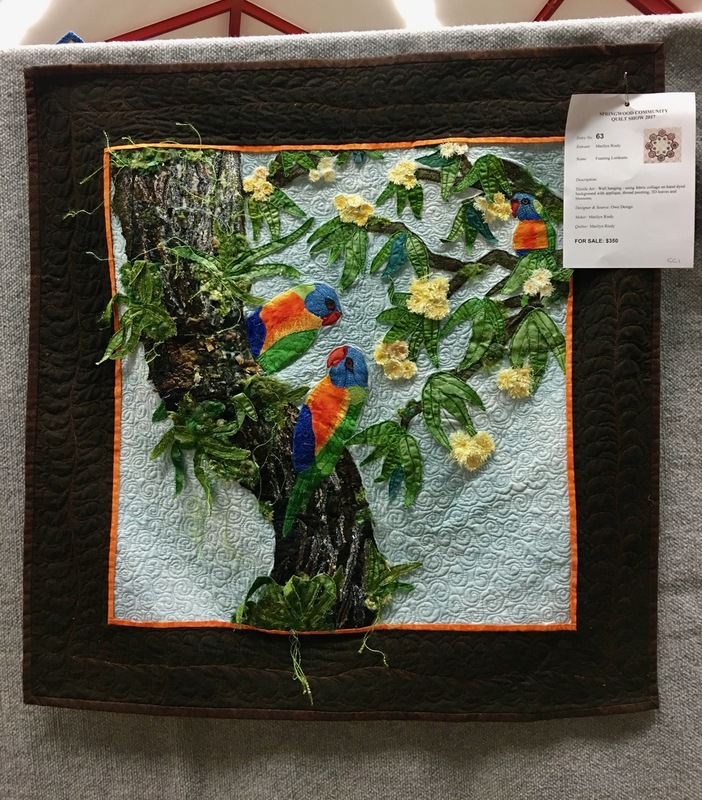 Last weekend was the Springwood Quilt Show. 130 quilts of all styles filled the Springwood High School Hall. People flocked from far and wide. 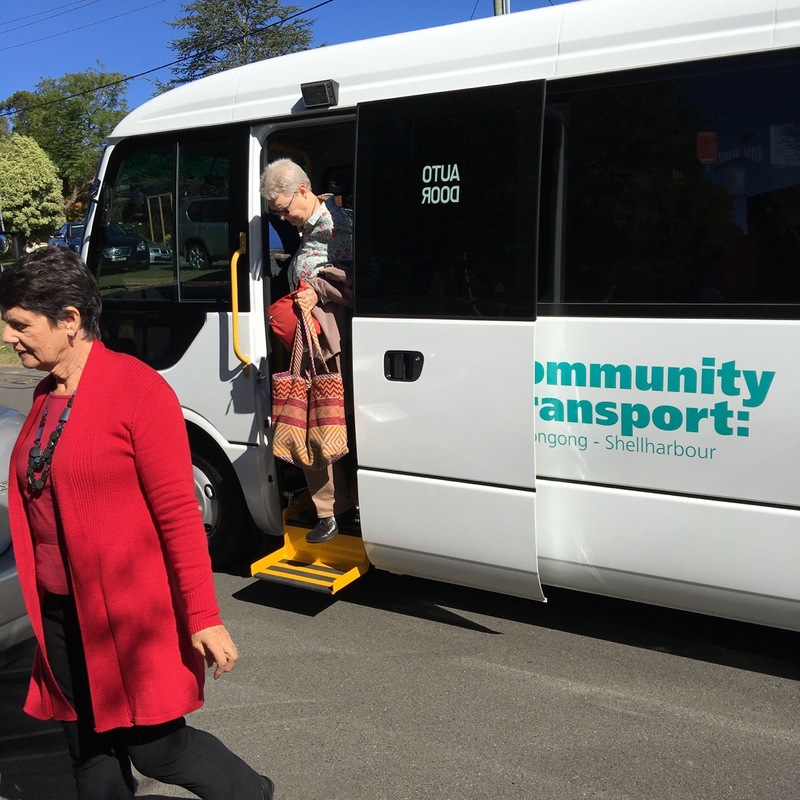 We even had a busload of lovely ladies from the Illawarra Quilters. One of the highlights of the show for me is getting to see Isobel Lancashire. She is such a treasure. She always has stories to tell and makes me laugh. 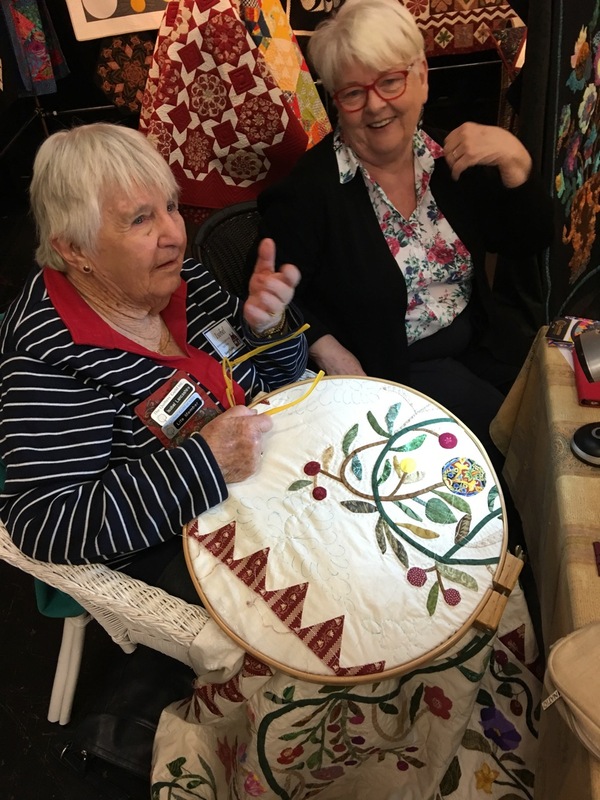 Sitting with her is the lovely Maureen Teager who was there to talk to people about QuiltNSW. I had the most wonderful time catching up with lots of friends, and meeting new people. 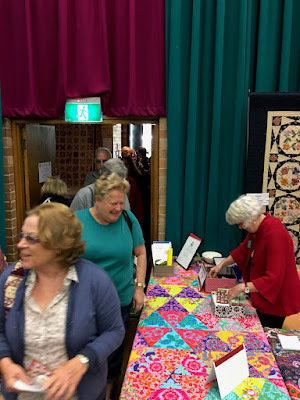 I'm always reminded at these event how lovely quilters are. 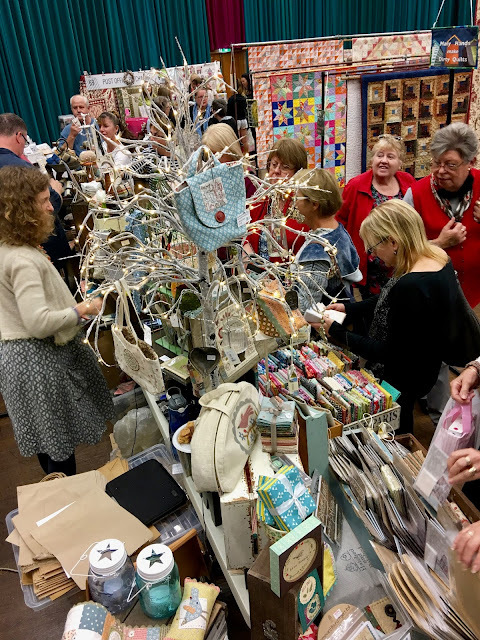 There were lots of super fabulous and fun stall holders!! 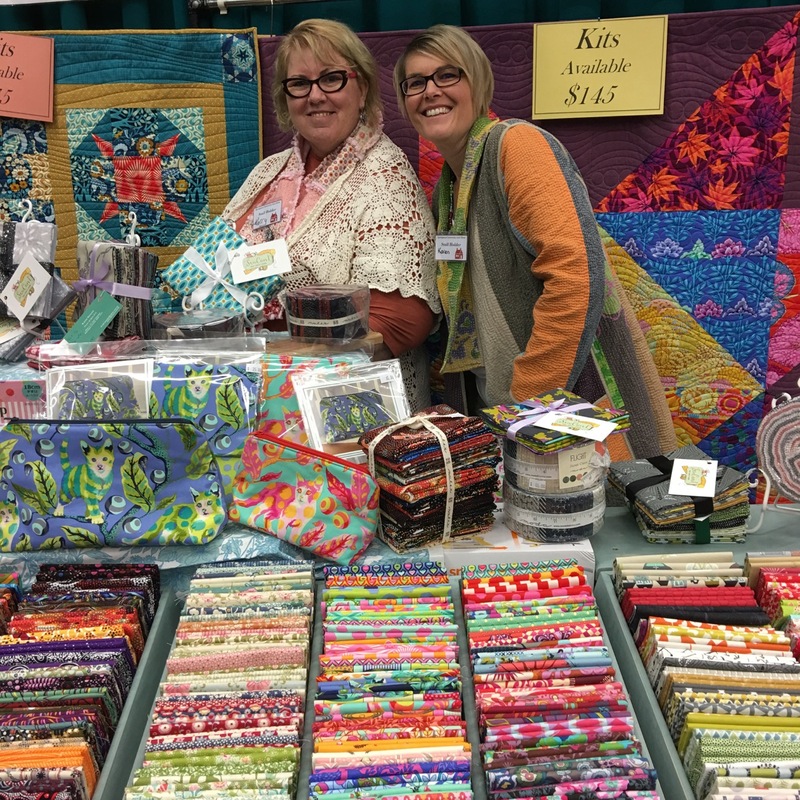 Love this photo of Karen and Kerry at Sew Can I for their big smiles, colourful fabrics, and Kerry's doily shawl. 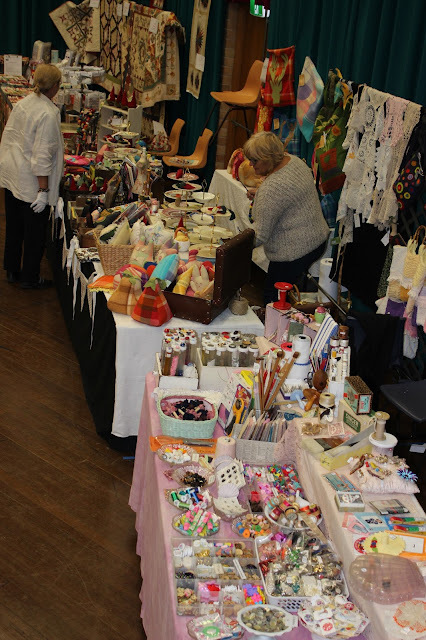 Lilyvale Treasures had such a great range of buttons, trims, vintage treasures and the next stall called Chop Chop Sew, run by Suzanne, was full of wonderful handmade goodies made from recycled vintage bits and pieces. Anni Downes from Hatched and Patched is always busy with people looking at her beautiful fabrics, patterns, and projects. It was really tricky to take photos of the quilts because the aisles were quite narrow. A small price to pay to be able to squeeze more quilts in the show, because I'm sure we all agree, the more quilts the merrier. 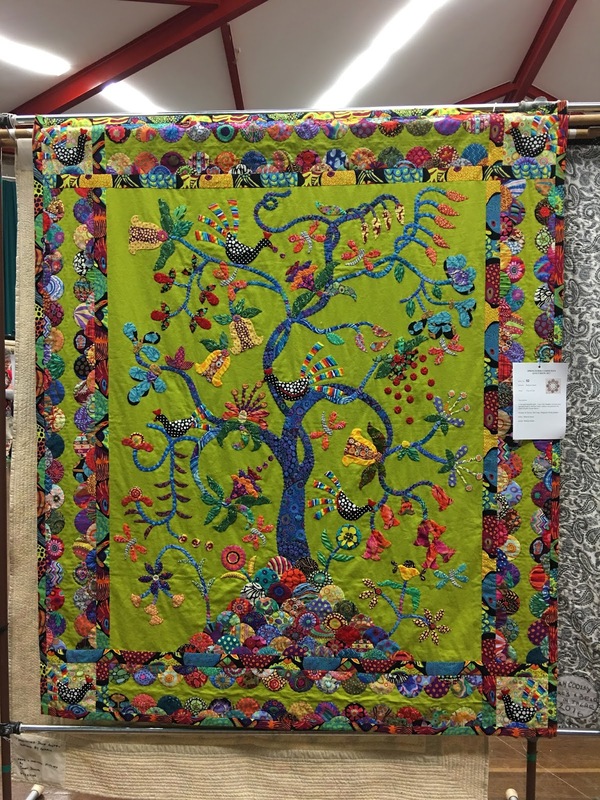 Robyne Stuart's Tree of Life ,based on a Sue Cody pattern, was one of my very favourites. What an inspired choice of green as a background for all those rich colours. To show some of the variety at the show here is a beautiful picture by textile artist Petal Davies. 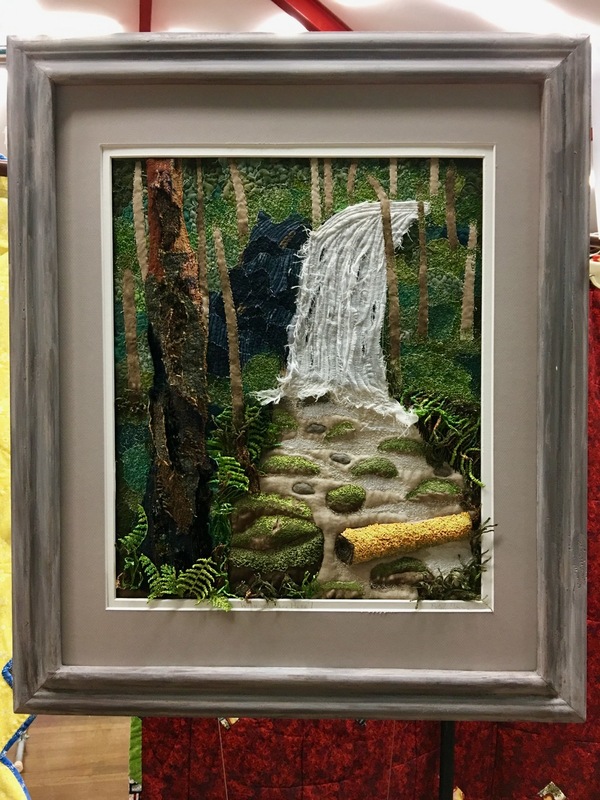 She uses all sorts of techniques to achieve her textile landscapes. It's aptly called Wish You Were Here because as you look at the picture you do indeed wish you were there. 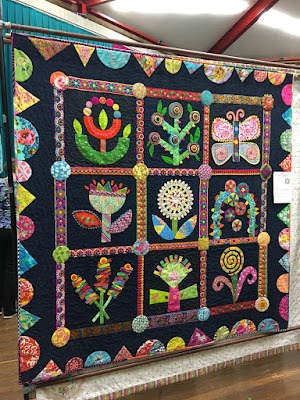 As for my quilts here is my Chunky Blooms quilt. 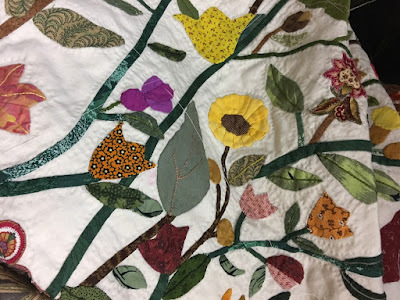 I don't think I've done a proper post about this quilt yet. It really needs some good photos in a sunny garden somewhere. 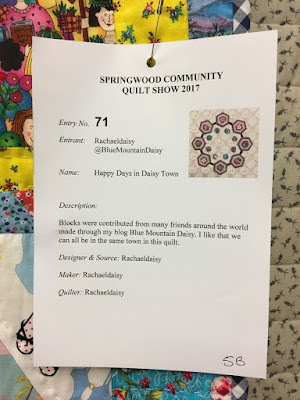 And my second entry was my Happy Days in Daisy Town quilt. 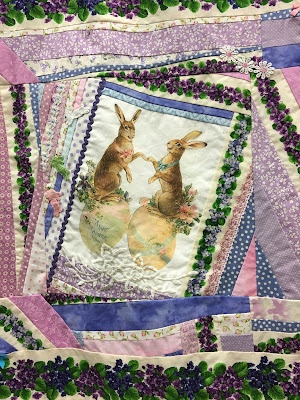 Most of you would remember that this was a group quilt I made using house blocks from blog friends around the world. I got to meet one of the contributors for the first time at the show. This is Karen, she doesn't blog anymore but her instagram account is @karens_photos. 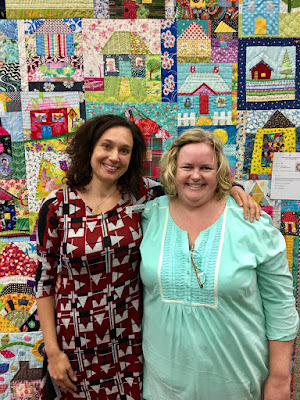 We've been blog friends since I started my blog 7 years ago so it was great to finally meet in person. She's as lovely in real life as I always thought she would be. The Springwood Quilt Show is a non-juried show however there are Viewers Choice awards handed out each day of the show. I am very, very, very excited and honoured to announce that Daisy Town won the Viewers Choice Award for Sunday. It's all the more special because it means all the people who made blocks can say they're award winners too. On the Viewers Choice award slips there is a place for people to write why they chose this quilt as a favourite. Many comments were about the fact this quilt represented friendship. 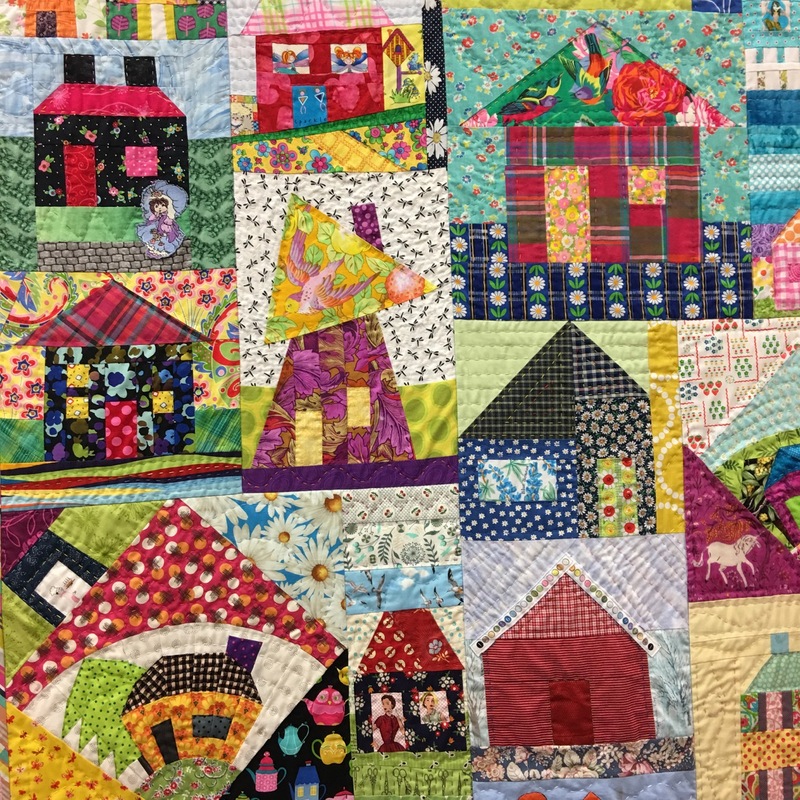 It means a lot that people appreciated that that's what this quilt is about. 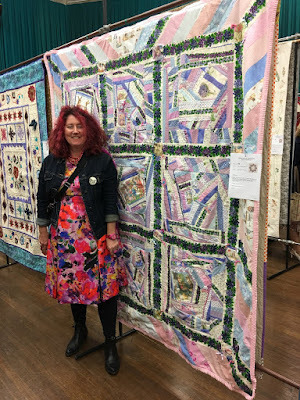 Others said it was a happy and joyful quilt and I'm always pleased to hear that about my quilts. 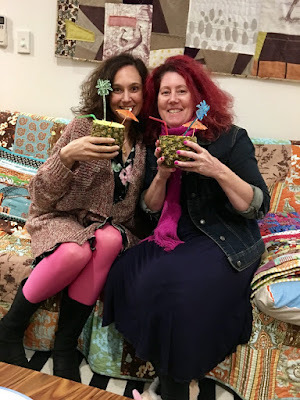 Always one last photo... it's not every day you get to drink pina coladas out of real pineapples, but a fun day with lovely friends deserved to be celebrated in style. Ooooh I get to be first to comment!!!! 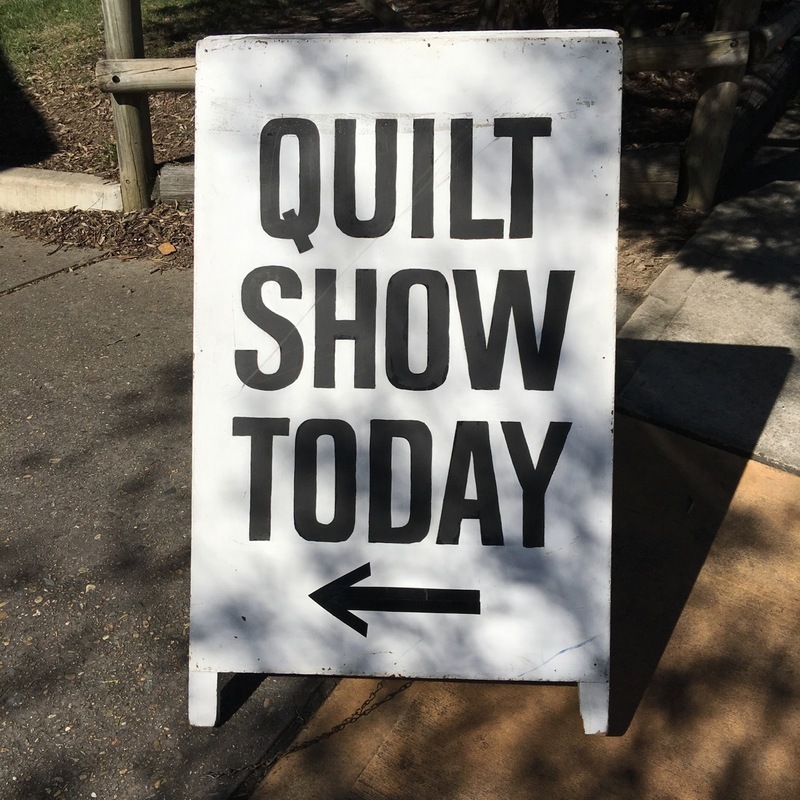 Now don't blow it......think of something pithy to say.......ummmmm......lovely quilt!.....doh, you blew it silly. What can I say , just star struck and giggly....hehehe. It's is lovely to see all the quilting ladies and laddies come together over a shared love of fabric and all its possibilities. Such bliss! What a fun post. 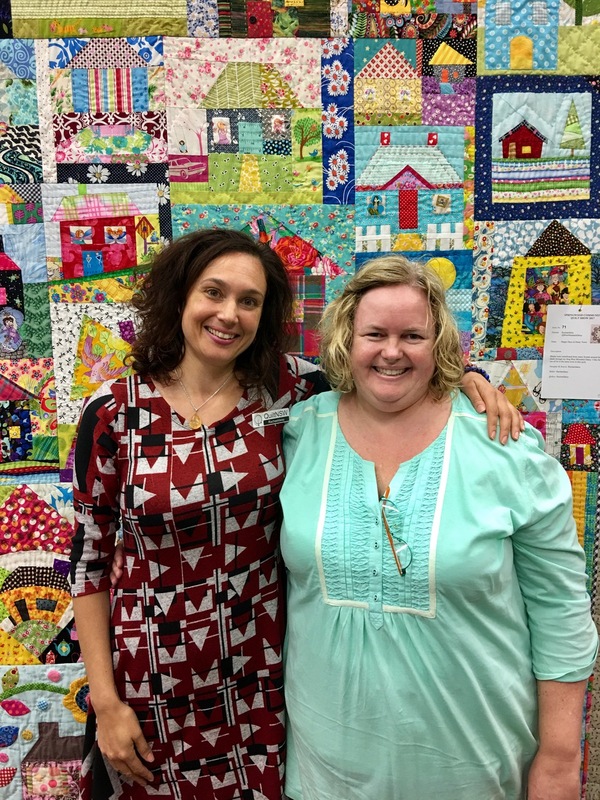 Such beautiful quilts and sharing with wonderful friends is the best. I can't believe your favorite was the Tree of Life. It is so subdued - wink! 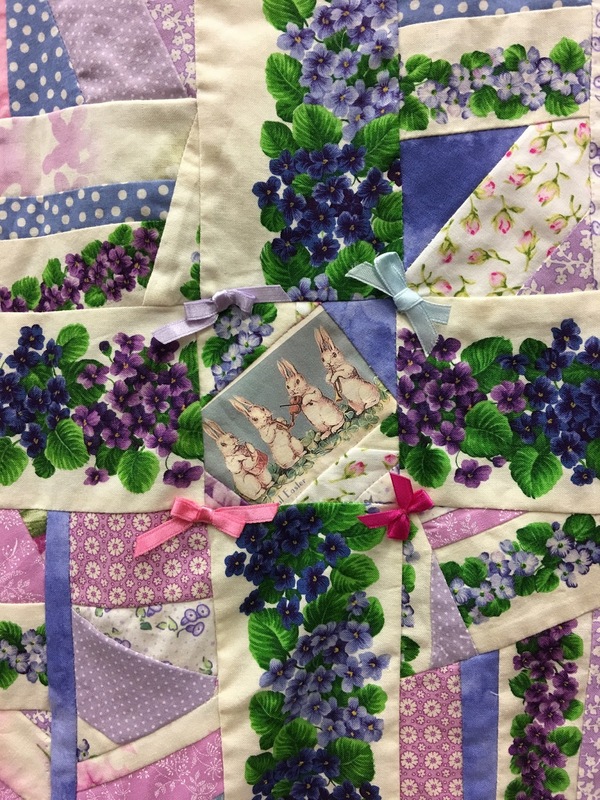 I love your Chunky Blooms quilt. Wow! And I too would vote for the Happy Days in Daisy Town. I am relatively new to Blogland, but I do love following such wonderful people around the globe. Funny, it seems now everyone is leaning toward other social media (Faceboook, Instagram,etc). Technology is moving us through this world so fast, I feel like I need the slower more human pace of the Blog. Bla, bla, bla... Thanks for a great post! Looks like it was a great show, pretty fancy pina coladas! Look forward to a few close up pics of your 'chunky blooms' quilt, looks like you have done some amazing embellishments! 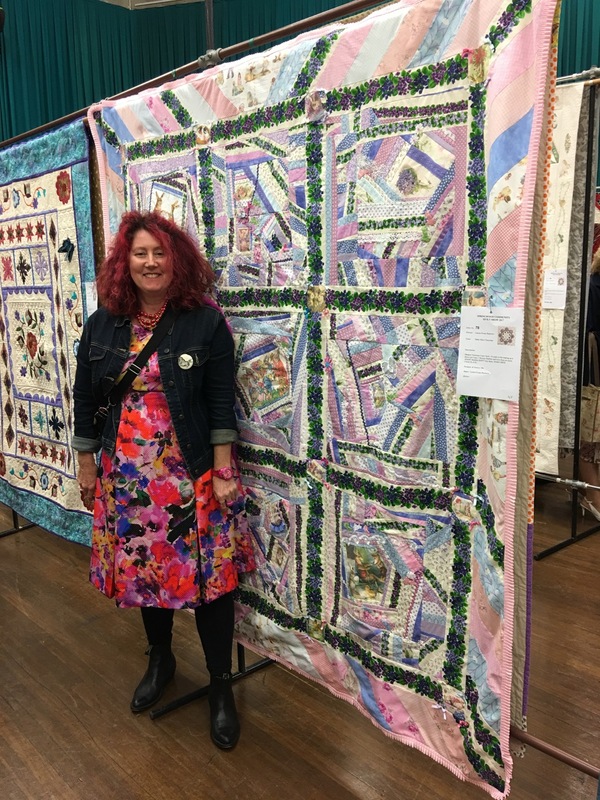 Isobel's work, while traditional in design, is beautiful! I think I had a house in your Daisy Town quilt but I can't see it or even remember it. Congratulations on the award! It is such a happy quilt. It looks like it was a wonderful show--so many quilts!! The shopping looks pretty good too, and of course meeting up with friends is the best part. Your colorful house quilt is awesome! What a wonderful show this is. 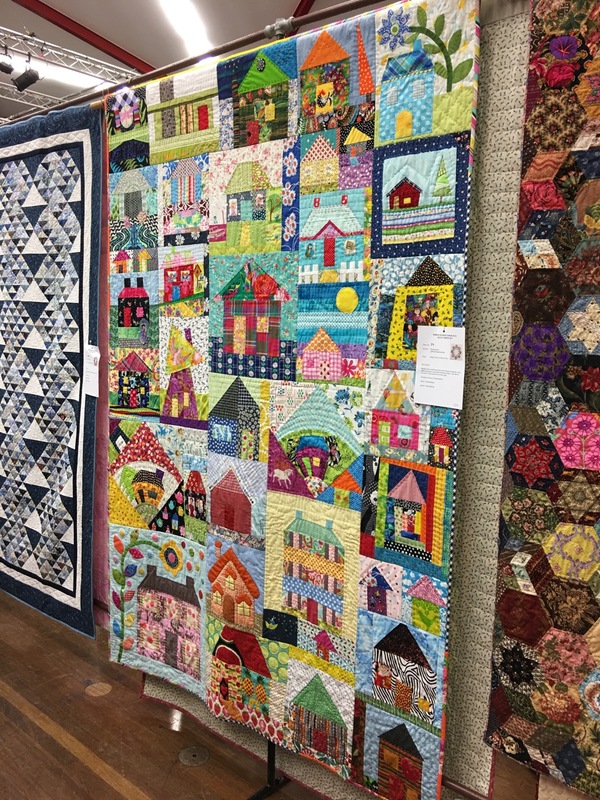 So great to see a large number of quilts on display. 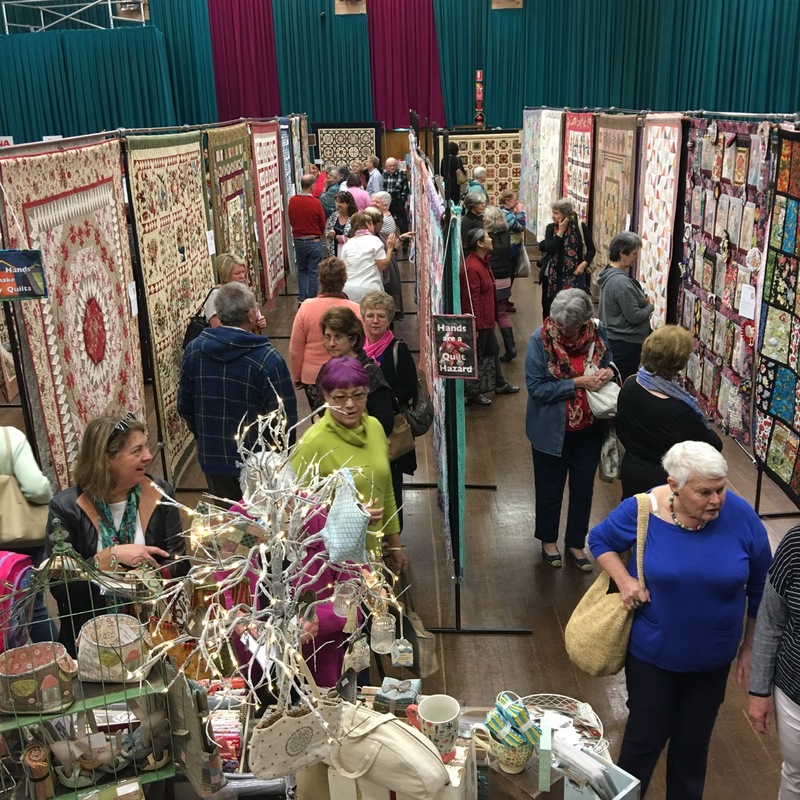 And it is also wonderful to see it being enjoyed by so many people. Congratulations on the viewers choice award That is a lovely accolade. 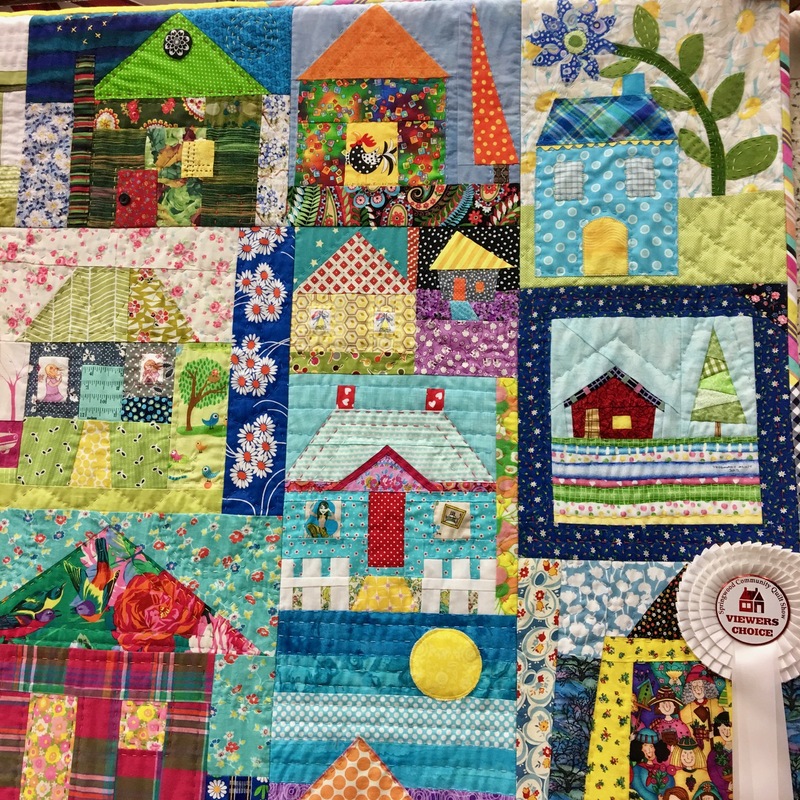 Congratulations - sounds like your quilt won for all the right reasons! Una mostra davvero spettacolare...le tue trapunte sono fantastiche! thanks for so many photos of your show. 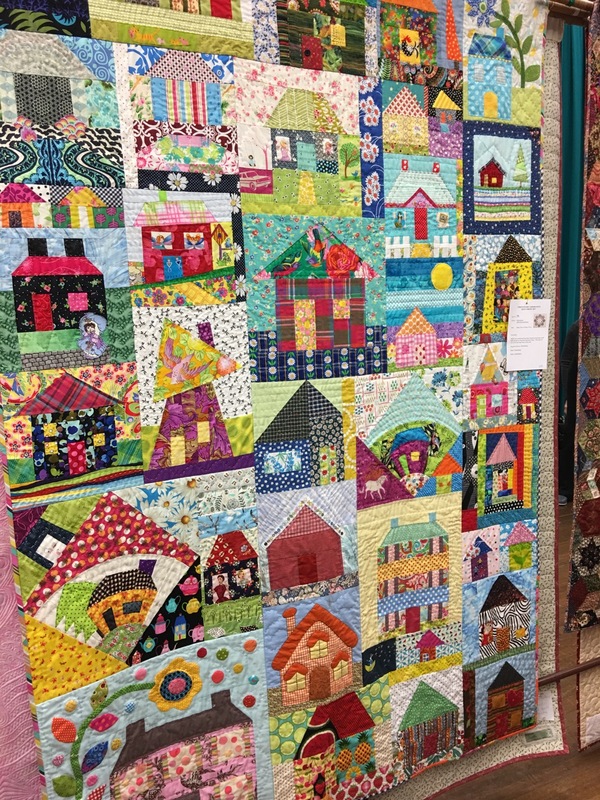 Looks like such a colorful collection of quilts. Congrats on your win!! yay - I'm happy to have a little house in your quilt. Looks like a winner of a show! Where to begin with and the beautiful quilts you've shown for us. 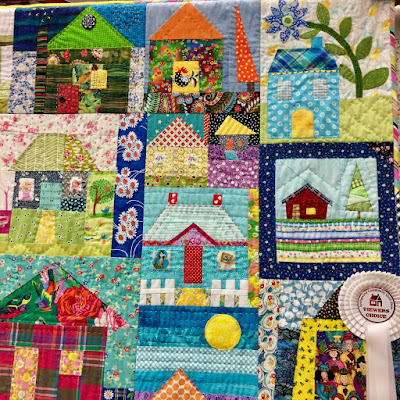 I always loved the Daisy Town quilt, happy it won Viewers Choice, and please do a post on the story of Chunky Blooms, a glorious, colourful quilt, I don't know which block is my favourite in this one! The stalls with all the fabric goodies are mouth-watering to see, I would have had to leave my money at home or go broke! Hi lovely! Just thought I'd swing by your blog for a look see and you didn't disappointed. .... I think we all need to blog again! Looks like it was a fun day ! 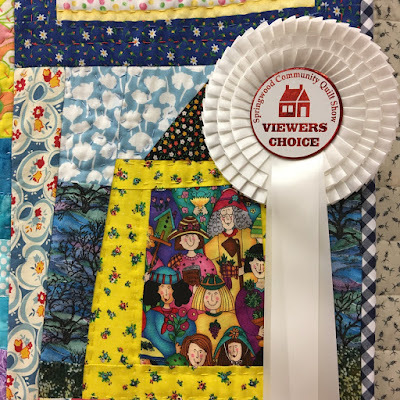 Congratulations - such a great viewers' choice quilt. 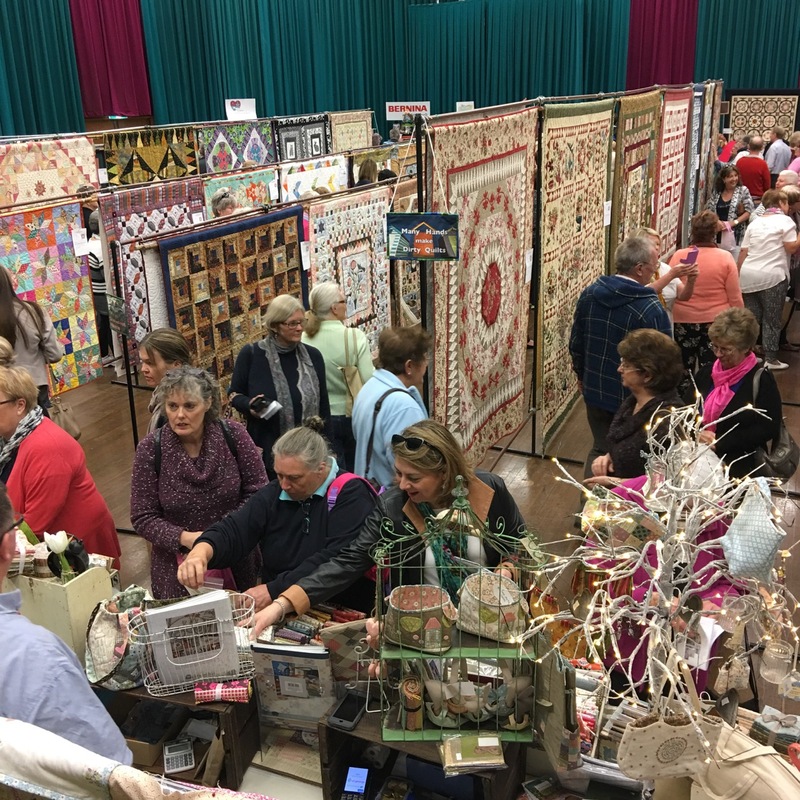 Thankyou for showing all those beautiful quilts and stalls.